, any plant of the genus Ligustrum, Old World shrubs or small trees of the family Oleaceae (olive family), some of which are common as hedge plants. Privet hedges are popular for their dark green leaves and their ease of cultivation even in adverse city conditions. , common name for any member of the small genus Forsythia of the family Oleaceae (olive family), European and Asian shrubs with abundant bell-shaped yellow flowers that appear before the leaves. They are easily cultivated and are used in hedges and borders. in botany, any plant of the genus Fraxinus of the family Oleaceae (olive family), trees and shrubs mainly of north temperate regions. The ashes are characterized by small clusters of greenish flowers and by fruits with long "wings" to aid in wind dispersal. ..... Click the link for more information. (Fraxinus) are valuable for timber in North America. The true olive (Olea europaea) is the source of the fruit also called olive and of olive oil; it is the most commercially important member of the family. 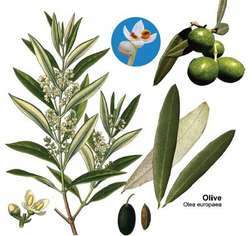 The olive tree, a small evergreen, has been cultivated since the beginning of historical times in its native Asia Minor. Its cultivation spread very early to all the Mediterranean countries, and this is still the chief area of production. It is now grown also in Australia, S Africa, Mexico, and California, where it was introduced (c.1769) at the San Diego mission by Spanish missionaries. The mission olive of today, a variety raised both for the table and oil, was developed from trees grown at California's missions. The several hundred horticultural varieties of olives, many cultivated since ancient times, differ in appearance, flavor, and oil content. Some varieties have been developed especially for oil extraction, the chief use of the fruit. Of the eating olives, green olives are picked when full-grown but unripe, and are often pitted and stuffed with pimientos or anchovies. Ripe olives, usually purplish black, are richer in oil. Both green and ripe olives are treated with lye to remove the bitter quality and then packed in brine. Olive wood, hard and close-grained, is used for cabinetwork and furniture. Olive trees are subject to several diseases; the bacterium Xylella fastidiosa, found in Europe for the first time in 2013, has devastated infected groves. According to Greek mythology the olive was Athena's gift to mankind, and Athens was named in her honor for this gift. The olive branch has been the symbol of peace since before Christian times, because the oil could be used both to heal human ills and to calm troubled waters. The first vegetation seen by Noah after the Deluge was the branch of olive brought back by the dove, and a dove bearing an olive branch has also been used in art as a symbol of peace. ..... Click the link for more information. , class Magnoliopsida, order Scrophulariales, family Oleaceae. You can't eat most olives straight off the tree, they contain a glycoside called oleuropein, which makes them intensely bitter. They need to be cured before they are edible. Most commercial olives are cured in Lye- (sodium hydroxide)-one of the main ingredients of Drano. Canned black olives have been pasteurized and soaked in ferrous gluconate – avoid them. The curing process is very tedious and takes up to 3 months. They need to be in water the whole time. The first month, the water needs to be replaces daily. Then salt water is added for the next month or two. Olives are rich in minerals, calcium, magnesium, amino acids, fats (both omega 3 and 6) High in vitamin A and E, many antioxidants, dissolves mucus. Really high in monounsaturated fat, which is good for heart, blood pressure and cholesterol. Olives are known for anti-cancer, anti-inflammatory, allergies, diabetes, colon cancer, arthritis. For Olive oil- if you can, use only STONE CRUSHED cold pressed extra virgin olive oil in dark bottles. Most “cold pressed” brands are made with machines that press them up to 160 degrees which kills the good properties. Stone pressed is best. The best part of an olive tree is... OLIVE LEAVES contain one of the most powerful immune system substances known, a potent antibacterial, antiviral, anti-fungal, antiparasite and antioxidant used for flu, meningitis, encephalitis, herpes of all forms, HIV, AIDS, pneumonia, blood poisoning, dental, urinary tract infections, TB, malaria, chronic fatigue syndrome, allergic symptoms, gives energy, stops painful joint ache, normalizes heartbeat, relieves the pain of rheumatoid arthritis, lowers blood pressure, muscle spasms in the intestines and heart arrhythmia, stimulates immune system, restores energy, boosts stamina. Particularly effective against herpes 1, 2, 6 and 7, shingles, Epstein Barr virus, tuberculosis, gonorrhea, malaria, severe diarrhea, blood poisoning, ear, urinary tract and surgical infections. You can make tea, grind dry leaves into powder or use the even more powerful extract. Any plant of the genus Olea in the order Schrophulariales, especially the evergreen olive tree (O. europea) cultivated for its drupaceous fruit, which is eaten ripe (black olives) and unripe (green), and is of high oil content.